Welcome to Day #4 of Chocolate and Salt Theme Week. 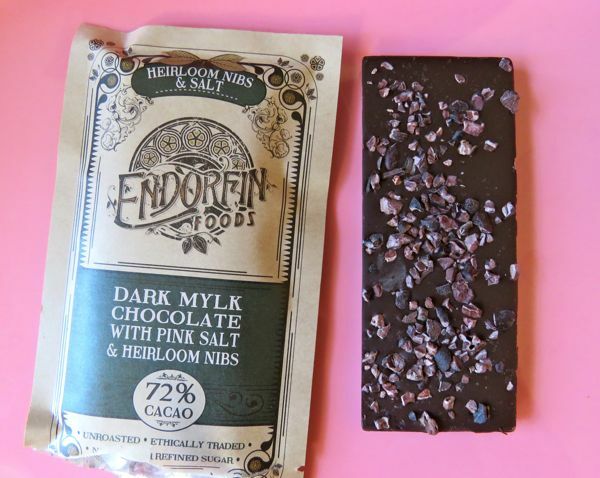 Today's 72% cacao Dark Mylk Heirloom Nibs and Salt bar from Endorfin Foods (Oakland, CA) contained a more subtle hint of pink salt than yesterday's 55% cacao "Mr. 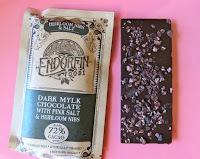 Pink" savory Dark Mylk Chocolate with Pink Salt and Pink Peppercorn bar from the same company. A generous sprinkling of cacao nibs (pieces of Heirloom Arriba Nacional* cacao beans) on the back side of today's bar added some crunchy texture and balanced, slightly earthy flavor. Endorfin's "Mylk" chocolate contains no dairy milk (or soy), but rather this line of bars (some single origin, and some with flavor inclusions) are crafted using cacao, coconut sugar, coconut and cocoa butter. In the spirit of "minimally processed whole food ingredients" Endorfin bars are made with fermented but unroasted cacao beans giving them a clean, smooth flavor, and without some of the roasted notes found in other dark chocolate bars. *Heirloom Arriba Nacional cacao is often associated with fine cacao coming from Ecuador after around 1890 (when strains (possibly Criollo) from Venezuela were bred with Forestero cacao in Ecuador). The aroma of these beans is sometimes described as having floral notes.